Foristell, Missouri angling veteran Lynda Gessner is heading into the 2011 Lady Bass Anglers Association (LBAA) Lady Bass Classic in a "state of knowing." She knows how she got here, she knows whom the favorites on Kentucky Lake will be, and she knows how she will have to fish to score a victory. "I think the reason why I did pretty good this year (fourth place in the pro Angler of the Year race) is the help I received from all my friends and fellow anglers, as well as having had some history on some of the lakes we visited this year," Gessner stated. "Pam (Martin-Wells) and Kim (Bain-Moore) of course are the favorites, but Secret (York) and Deb Warner have a good shot, since it is their home lake," Gessner went on to say. "Folks are saying the fish are still out on the ledges -- you just have to know which ones. It's a big lake with lots of ledges," she went on to say. "Additionally, since they are drawing down for winter pool I don't think the fish are going to be in the very backs of the coves yet, maybe secondary points starting to move back. It just depends on the weather. I am going to try to see if I can get them deep and if not, I will start moving back into the creeks to try to find them." October 6-8 are the dates for the inaugural Lady Bass Classic on Kentucky Lake and this is a homecoming of sorts for the LBAA, as it has its roots in the Land Between the Lakes region of western Kentucky. LBAA Co-founder Secret York is from Benton, Tournament Director Lynn Wilson is from Paducah, Treasurer Vickie Barlow is from Grand Rivers, and staff member Greg Warner hails from Murray, Kentucky. Each member of the LBAA staff has a learning year, a year full of hard work, that is also comprised of many memories. "The charity tournaments are very important. We should always try to leave where we have been a little better than when we arrived," stated LBAA Treasurer Vickie Barlow. "If we just go to an area to fish, we help the economy of the area a little, but by doing the charity tournament we help one specific group, as proven by the amounts our LBAA Charity Events have given back." Tournament director Wilson was quick to add, "I know of no other organization that makes an effort to get involved with the communities like we do." Wilson, a veteran not only of bass tournaments, but also of administering tournaments stated, "Each tournament is different and the preparation for each location is different and I have done my best to provide a professionally conducted weigh-in for each tournament in each city that we have visited." In reflecting back Wilson went on to say, "I like being able to assist the ladies when they had problems while on the water. I have also had a great opportunity to develop a working relationship with Greg Warner, Bill Thompson. Don Day and Larry Morris -- they are true professionals." The LBAA is indeed heading back to its grass roots with its biggest tournament to date -- the 2011 LBAA Lady Bass Classic this week on Kentucky Lake. The 2011 LBAA Lady Bass Classic will have 42 total competitors, 21 that will compete in the pro division and 21 that will compete in the co-angler division. The competitors earned a berth in the 2011 LBAA Lady Bass Classic by their finishes earned in the four 2011 regular season tournaments. 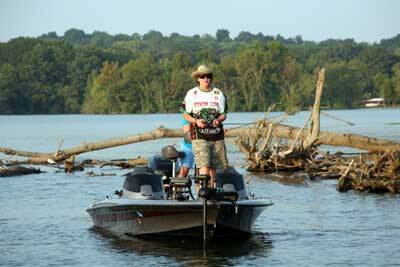 Each regular season finish had an accompanying number of points that anglers accumulated as the year progressed. Official practice days for the 2011 LBAA Lady Bass Classic continue through October 5 with anglers being off the water by 3 p.m. on the fifth. Competition days for the 2011 LBAA Lady Bass Classic are October 6, 7, and 8. Launch will be at local safe light each morning and competition concludes each day at 3 p.m. All launches and afternoon check-ins will be held at Moors Resort and Marina 570 Moors Road in Gilbertsville, Kentucky. Upon check-in, all anglers will then trailer to the weigh-in, which will be held at the Fisherman's Headquarters, located at 2754 US Highway 641 Benton, KY 42025 (270) 527-5938. Host lodging and tournament headquarters for the LBAA Lady Bass Classic is Moors Resort and Marina 570 Moors Road Gilbertsville, Kentucky 42044. 1-270-362-8361 or 1-800-626-5472. //www.moorsresort.com.